Explore the comfort, efficiency and longevity of our line of boilers. The versatility of a hot water system is unmatched in the industry. Capable of providing domestic hot water, snow melt, and indoor heat, boilers are the core of a versatile hydronic system. When dealing with complex hydronic systems experience is everything. Versatile do everything systems don’t mean anything if they don’t function. Trust the expertise and experience at Baumann & DeGroot. We have some of the most educated, knowledgeable, and respected designers and technicians in Michigan. We are familiar and comfortable designing and installing everything from a 30 zone multi-temperature full automated hydronic system to a standard hot water heat system in a home. Baumann & DeGroot offers free estimates. Whether you are looking for an in-home estimate at your home to replace your existing boiler or are looking to do a full radiant system in your new home we will give you an honest evaluation of what your best course of action is based on your goals and budget. The Bradford White Brute Mini provides the best standard efficiency radiant heat for the price. Built simply these units are easy to maintain and service and should provide years of reliable cost affordable heat. The Viessman Vitodens 100 comes from the legendary Viessmann company out of Germany. 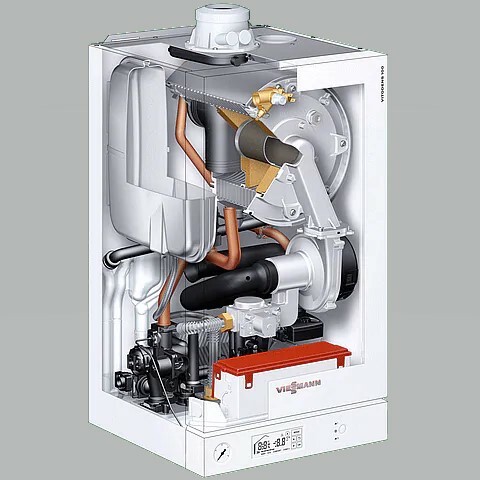 Viessmann is the worlds largest manufacturer of boilers, they manufacturer every single component so the costs, quality, and availability is always within the company’s control. It comes with components usually added on during the installation already pre-built into the unit. This provides extra value and reliability this is backed with an industry leading warranty. Check out this boiler for your radiant and potentially domestic hot water needs. The Lochinvar Knight boiler brings the boiler into the 21st With a 10-1 turn down ratio and the Con-X-Us remote control application puts the control in the homeowners pocket and the ability for the contractor to remotely monitor and adjust the system with no need for time consuming service calls. This is a top of the line solution for top of the line demands and problems. The Navien NHB wall mounted condensing gas boiler carries features and efficiencies found in much larger ground mounted boilers. Taking advantage of its compact size these units are the most popular condensing boilers in the world. See how a Navien NHB will help with your heating or snow melt bills while opening up space for other storage needs. Flexible financing options to fit your budget. Let the savings continue with great rebates. Baumann & DeGroot is always accepting applications for hard-working, intelligent individuals. If you are interested in being a part of our team, please fill out our employment form. Follow us on Facebook. Follow us on Google. Baumann & DeGroot is proud to serve the heating & cooling, ventilation, fireplace, and air quality needs of the following communities in West Michigan: Holland, Grand Rapids, South Haven, Grand Haven, Grandville, Spring Lake, Ferrysburg, Saugatuck, Allendale, Walker, Wyoming, Hamilton, Fennville, West Olive, and Zeeland. © 2016 Baumann & DeGroot of Holland Michigan.